As the Miami Heat and Indiana Pacers prepare for Game 1 of the Eastern Conference semifinals on Sunday, a handful of TV and Internet analysts have noted that the Pacers match up well against the favored Heat. Indiana has the size and talent to slow Miami’s march to the conference finals, they say, and perhaps pull off a stunning upset. And for all of Indiana’s athletic wings and plucky role players, the team’s chances to advance past the second round rest on one Pacer: David West. West is already vital to the Pacers’ offense, but against the Heat his role and his skill set becomes even more important. That’s because West excels in the play that the Heat defense struggles to guard most: the pick-and-roll. In the first round, Knicks big men posted 1.103 points per possession (PPP) when they ran pick-and-rolls against the Heat. Miami’s defense in those situations ranked 14th among the 16 teams in this year’s playoffs. The Heat defensive strategy on pick-and-rolls involves a hard show from the big man guarding the screener, which should lead to scoring opportunities for a pick-and-pop big man like West. Of the 175 ball screens West set this season, he popped 145 times. So far in the playoffs, all of West’s baskets in pick-and-roll situations came from pops instead of rolls. When West runs the pick-and-pop, he converts 56.6 percent of his catch-and-shoot jumpers. Those are the kinds of shots that should be available for him in Round 2, so let’s go back to the regular season and see how West looked against Miami earlier this year. On this possession, West sets a screen for Darren Collison. They are the only two Pacers occupying the strong side, while Roy Hibbert, Danny Granger, and Paul George hold down the weak side. When Collison uses the screen he gets trapped by his man, who works over the screen, and Chris Bosh, who leaves West to double the ball. West pops out toward the wing. Look at the remaining Heat defenders when Collison passes to West. They’re all marooned on the weak side, so it will be incredibly hard to close out on West, who has a wide-open look on the wing. Also, watch how Roy Hibbert “ducks in” as the pick-and-roll takes place. He steps into the lane and seals, looking for the ball. This occupies Joel Anthony and forces him to hesitate while he decides whether to stay with Hibbert or close out on West. That hesitation is all West needs to get off an open jumper, which he knocks down. Here is the play in real time. Running pick-and-rolls between West and Collison or George Hill also takes Miami’s two best perimeter defenders out of the play, with LeBron James and Dwyane Wade stuck guarding Granger and George on the weak side. And while they’re left out of the play, Hibbert’s duck-in occupies Anthony and prevents him from contesting West’s shot. 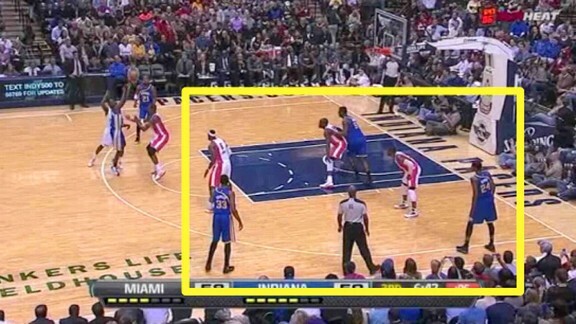 If the Pacers call this pick-and-pop play a few times, it should soften up the rest of the Miami defense. For example, it should allow West to find his open teammates. The Pacers start this play with Granger and George in the corners, Hibbert on the block, and West setting a high screen for Collison. The Heat trap Collison off the screen, and as soon as that happens West floats to the free throw line. Collison passes to him there, and because West is a good shooter, the defense rotates toward him. Joel Anthony leaves Hibbert to cover West and LeBron James slides over to keep Hibbert from getting an easy high-low pass. 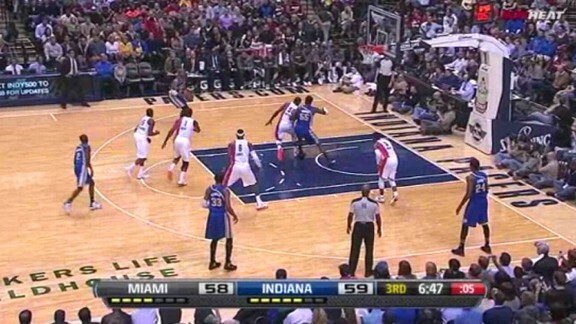 This leaves Granger open in the corner, and West finds him for an open 3-pointer. I’ve written this before, but the Heat rarely deviate from their defensive philosophy of showing hard on ball screens. That means that David West should get several opportunities to hit pick-and-pop jumpers, and if the Heat defense starts rotating to challenge his shots, then he’ll be able to find Hibbert down low or shooters like Granger in the corners. If Indiana moves the ball and hits open shots, Miami may have a very difficult time getting stops in this series. Aside from the pick-and-pop, West will be a huge factor for the Pacers down low, where he will be posting up against Chris Bosh. 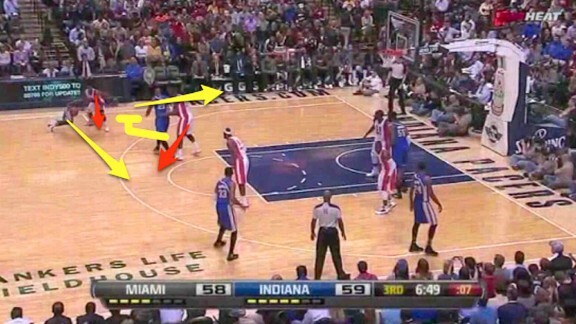 Some people might expect Hibbert to get the post touches, but I think those opportunities should go to West. Why? Well, for starters, Hibbert has been struggling in the post during the playoffs. In the first round, he scored just 26 points on his 33 post possessions against a Dwight Howard–less Orlando Magic. Against the Heat this season, Hibbert scored just 18 points on 27 touches in the post. Meanwhile, West was money on the block against Orlando, scoring 44 points on 34 post touches. Against the Heat, West scored 14 points on 13 post touches. He has been successful because he’s stronger than many opposing power forwards and he’s very good when he has time to back his man down. The Heat usually don’t double-team the post, so West should be able to take his time on the block and get the shots that he wants. Watch how deliberate West is during his post touches against Miami. He catches the ball, holds it for a moment, and pounds his weaker defender until he’s in scoring position. Through all this, he never faces a double-team. This is because if the Heat double him, West will pick apart the defense and find his teammates for open shots. But by leaving West alone, they allow him to get pretty much any shot he wants in the post. They didn’t double him once during the regular season, and I don’t expect them to start during the playoffs. Miami coach Erik Spoelstra doesn’t tinker with his defense very often because it’s one of the best in the league. If that trend holds, we can expect West to get a lot of touches on pick-and-pops and in the post. If he makes good decisions on offense and hits open shots, West can give the Pacers a good chance at pushing the Heat to six or seven games, and he just might be able to set them on the path to an upset.